James Tully walks two hours to work everyday along a Pennsylvania roadway, in the vicinity of where suspected cop-killer Eric Frein has been spotted. 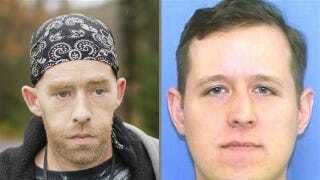 Tully has a slight resemblance to Frein and has been stopped by police several times. Now donations are coming in so he can have a car to get to work. Tully told NBC news that the frequent stops by local law enforcement have become "part of the routine" along his 5 mile walk. One day he was stopped a total of seven times. On September 12th, Frein ambushed two state troopers near their barracks, injuring one and killing the other. A massive manhunt has ensued and while there have been a few sightings the suspect has not been apprehended. Needless to say law enforcement are taking every precaution to catch Frein, and sometimes that includes searching people like Tully. There was one instance where an officer approached Tully, gun drawn and then pinned him to the ground. "From the minute I saw him with that gun I thought, let me survive this,"
Donors have set up a GoFundMe campaign to get Tully a car so he can drive to work and not have to worry about the constant run-ins with law enforcement. As of this morning the donations totaled $4,400 and we know plenty of reliable cars that would fit that budget.